You’ll probably do more text editing on your Samsung Galaxy tablet than you realize. That editing includes the basic stuff, such as spiffing up typos and adding a period here or there as well as complex editing involving cut, copy, and paste. The concepts are the same as you find on a computer, but the process can be daunting without a keyboard and mouse. The first part of editing text is to move the cursor to the right spot. The cursor is that blinking vertical line where text appears. On most computing devices, you move the cursor by using a pointing device. Your tablet has no pointing device, but you do: your finger. To move the cursor, simply touch the spot on the text where you want to move the cursor. To help your precision, a cursor tab appears below the text. Move that tab with your finger to move the cursor around in the text. After you move the cursor, you can continue to type, use the Delete key to back up and erase, or paste text copied from elsewhere. By the cursor tab, you may see a pop-up containing a Paste command button. That button is used to paste text. Selecting text on your Galaxy tablet works just like selecting text in a word processor: You mark the start and end of a block. That chunk of text appears highlighted on the screen. How you get there, however, can be a mystery — until now! Start selecting by long-pressing the text or double-tapping a word. Upon success, you see a chunk of text selected. 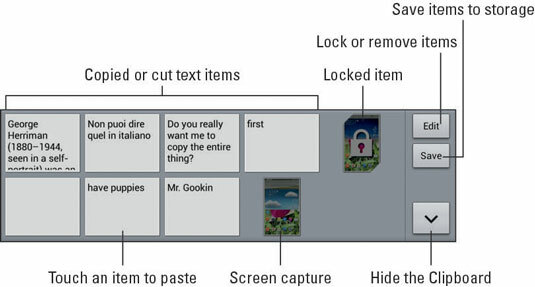 Drag the start and end markers around the touchscreen to define the selected text. To select all the text, touch the Select All command. It appears on the text selection toolbar that appears whenever text is selected on your tablet. One of two different text selection toolbars may appear; one is native to Android and the other from Samsung. The Galaxy Note’s S Pen can also be used to select text, but there’s no trick: It’s used just like your finger: Long-press text with the S Pen to select a word. Using the S Pen is more civilized than using a finger, of course. After you select the text, you can delete it by touching the Delete key on the keyboard. You can replace the text by typing something new. Or you can cut or copy the text. To cancel text selection, touch the Cancel button, or just touch anywhere on the touchscreen outside the selected block. Selected text is primed for cutting or copying, which works just like it does in your favorite word processor. After you select the text, choose the proper command from the text selection toolbar: To copy the text, choose the Copy command. To cut the text, choose Cut. Just like on your computer, cut or copied text on your is stored in a Clipboard. To paste any previously cut or copied text, move the cursor to the spot where you want the text pasted. If you’re lucky, you’ll see a Paste command button appear above the blinking cursor. Touch that command to paste in the text. If the Paste command button doesn’t appear, touch the blue tab. If the command button still doesn’t show up, text cannot be pasted for some reason. Another way to paste text is to use the Clipboard. To summon the Clipboard, touch the Clipboard button on the onscreen keyboard, or touch the Clipboard icon on the Samsung text selection toolbar. You see both text and graphics items that have been recently cut or copied. To paste an item, position the cursor in the text and then choose something to paste from the Clipboard window. You can continue to choose items and they’ll be pasted as long as you like. When you’re done, touch the down-pointing arrow to hide the Clipboard. You can paste text only in locations where text is allowed. Odds are good that whenever you see the onscreen keyboard, you can paste text.